Depending on the species the clients would like to fish, I will take them either to Lakes for trout or Russian, Kenai River for salmon and trout. I have waders and gear for everyone. If they do not specify where they would like to fish I will take them where the fish are depending on the time of year. Secret spots and fly-ins are all over the area that offer unique experiences based on the time of year, run strength and desires of the fishing client. These spots are often shared or offered to the adventurous and willing customers. All necessary gear is provided by Corey. Carter Lake is a beautiful alpine lake above the town of Moose Pass. Access to the lake is via 1 mile uphill hike along a well maintained trail with incredible views of Upper Trail Lakes and Johnson Pass. Fly fishing is practiced from the shore or wading into shallow waters from a few secluded spots. The catch rate is very high, especially when the ice goes out and later in the summer when the rainbows migrate to the creeks. Carter Lake is an ideal candidate for a ½ day fishing trip. 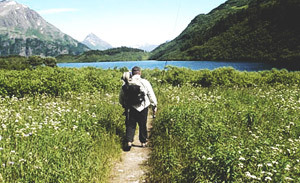 The hike to the lake starts from the trailhead located at Mile 33 of the Seward Highway. Crescent Lake is accessed by meandering another 1 mile beyond Carter Lake through Alpine Meadows. The lake, which is much deeper and colder, offers magnificent grayling and rainbow trout fishing. A popular activity is the lakeside lunch of fresh grayling. Many small creeks feed the lake which offer unique fishing opportunities. Quartz Creek is a secluded river that meanders from Tern Lake to Kenai Lake. 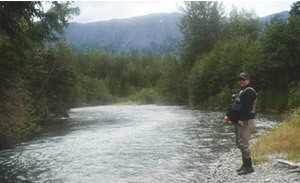 The river is easily accessible from the Sterling Highway from mile marker 41-43.5 and offers a great option for ½ day trips and for clients who want to get right to the fishing without the hikes yet enjoy the seclusion and unique out door experience and the opportunity to catch the plentiful Dolly Varden. 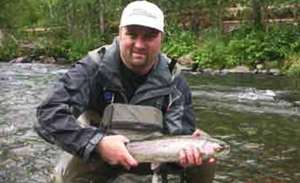 It is an excellent alternative to the â€œcombat fishing â€œon the Kenai River. Russian River is known for incredible red salmon runs that have two peaks, in mid June and late July. 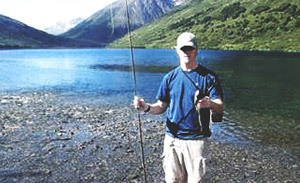 The river can be fished from the confluence of the Kenai River up to a set of beautiful lakes. Up river offers the opportunity to harvest beautiful bright salmon which are mixed with trophy rainbow trout. The river is heavily fished but the successful angler must rely on knowing the right spots and how to maneuver amongst the people and the bears and often confusing and changing regulations. Access to the Russian River is at Mile 52 of the Sterling Highway at the Forest Service campground. There is a short hike to the trailhead and the trails are relatively flat. 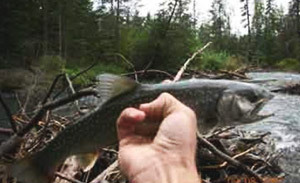 The harvest limit changes according to run strength and anglers are encouraged to keep their salmon catch. 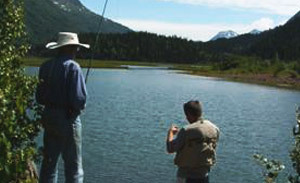 Upper Trail Lakes is a spot where spin casting is very popular. It is a great evening or short day activity for youth and novice fisherman or fly fisherman desiring to gain some practice and exercise their gear. Drive directly to locations and fish for rainbow trout, Dolly Varden, lake trout and the rare white fish. 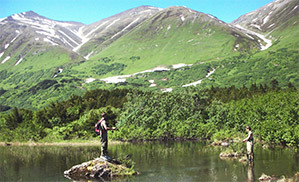 Ptarmagin Creek is located at Mile 23 of the Seward Highway, the river is a 5-10 minute hike. Fly-fish the river down to the mouth of Kenai Lake. Fish for rainbow trout and Dolly Varden which follow the migrating salmon to and from Kenai Lake. This is a great ½ day trip or early morning late afternoon sojourn.